It is that time of year again. I unveil my 2015 financial goals. Before I do, I’ll look back at my recent yearly goals. In the footer and sidebar, I have added a tracker for my retirement and other savings to help me have a fuller picture of my finances. Pay cash for an international trip – $?? My student loan goal doesn’t look like much of a drop, but you have to remember that the first $750 that I pay each month is just going to interest, not principal. So it will take nearly $15k in payments to get from $113k to $108k. Undoubtedly, I have some more thinking to do to figure out how to prioritize all of these goals. Save for retirement or pay down debt? 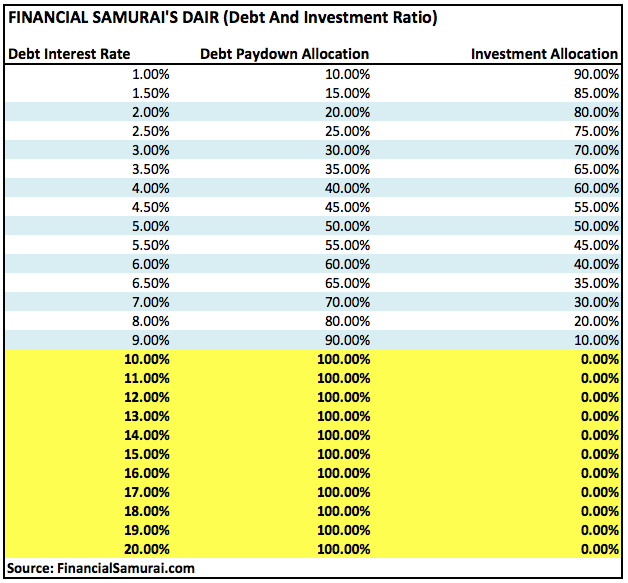 Financial Samurai has posted a formula for determining how to prioritize debt repayment vs. retirement funding. His FS-DAIR (Financial Samurai Debt and Investment Ratio), looks like the tool I’ve been hoping to find for a while now. How does it work? This chart lays it all out in a clear format. Basically, any debt that you have carrying 10% or higher in interest, should be paid off post-haste, at the expense of any investing (beyond the 401k employer match). Once your debts have interest rates at 9% and below, things get interesting. Read Sam’s FS-DAIR post for examples of how this works. 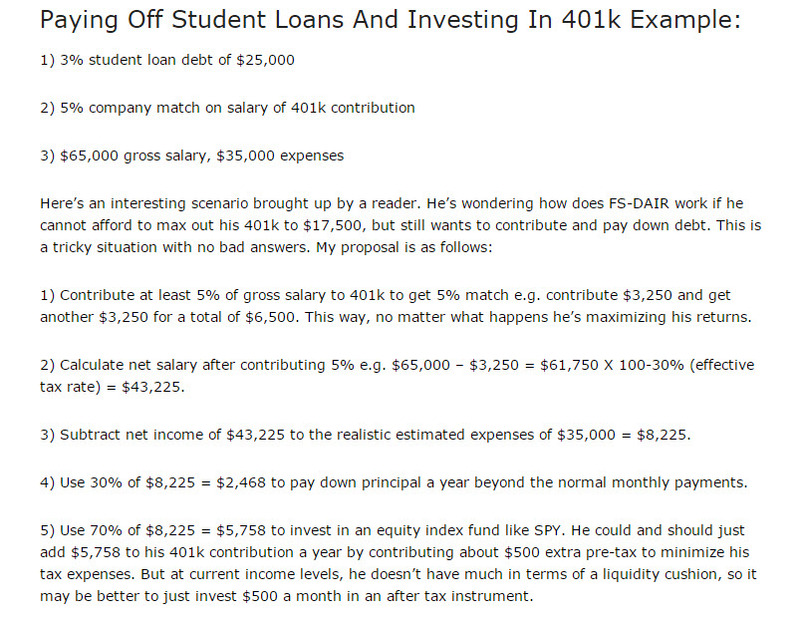 For instance, Sam uses the following as an example for someone deciding how much to put toward student loans vs 401k. My student loan debt is made up of many separate loans with different fixed interest rates. I will need to run the numbers to see how this would shape my plan of attack. I’ll do a follow-up post on this in the not too distant future. Thanks, Sam for lending me a sword to use in my battle! As my debt drops in 2015, I’ll be tracking my Net Worth. My first goal will be to see it drop down into the 5-digit zone. Soon you will also be able to track it here @Rockstar Finance. I will be pretty low on the ranked list, but I will be gunning for higher and higher slots. Watch out Finance Phoenix and Feisty Finance! I’m really glad you’ve started a retirement account alongside everything else. The FS chart is really interesting and I wish I’d seen it a couple of years ago; I decided to concentrate on paying down loans before I invested anything but in retrospect I think this was a mistake. 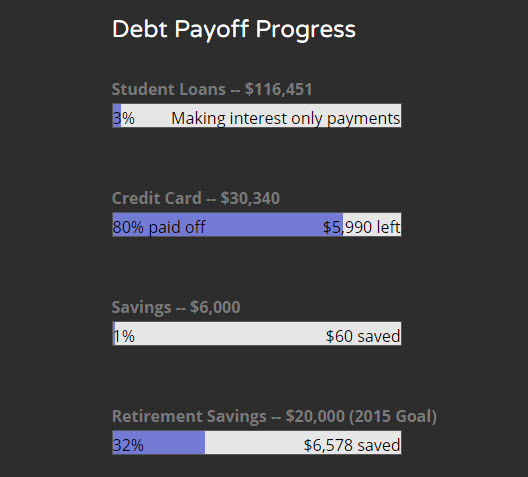 If I were doing it all over again…well, if I were doing it all over again I wouldn’t have taken out loans 🙂 But my debt was split between 5.5% and 6.5% loans and I think I should have started *some* kind of retirement account a year earlier than I did. Probably it won’t end up making an enormous difference thirty years from now, but still, on principle, I think people our age should be setting something aside. Do you use Ready for Zero or some other kind of tool to keep track of all the loans? I only had two, plus the credit cards, so they weren’t that hard to manage, but I’m always amazed at how people who have ten or twelve smaller loans keep from accidentally defaulting. Do you use Ready for Zero or some other kind of tool to keep track of all the loans? I do have a Ready for Zero account which shows all of my individual loans and recommends which ones to attack in order of interest rate and debt size. So I will also use that as a guide. Thanks for the heads up. I really think you should read Total Money Makeover. It will really make you think differently about your priorities. Good luck! Nice work on yours strides towards your 2014 goals… and Setting new goals for the year ahead in 2015!!! Looks like you have been killing it the past couple of years… AWESOME JOB!!! 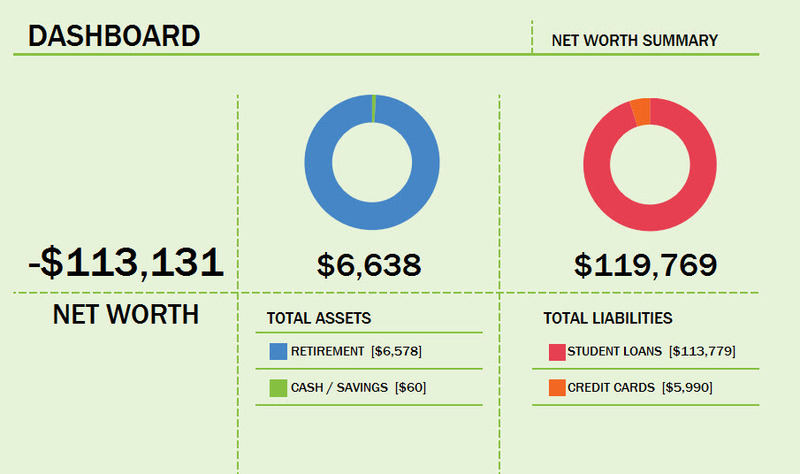 Networth is a great tracker to look at your overall position.